I have a lot of tops that need to be quilted. Lots and lots. I've been saying that I wouldn't quilt in the summer because it is too warm. The latest round of hot (upper 80sF) and then cool (in the 50s and 60sF) made me realize that every day all day long isn't always hot. Maybe I need to figure something out. 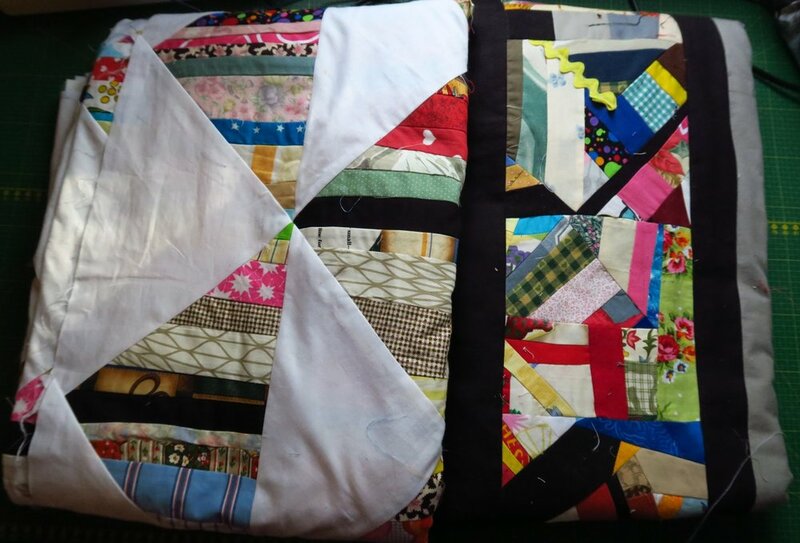 My winters are just too short to get all the quilting I want to get done, done--that is, if I am going to do piecing as well. And the thought of not piecing for months at a time... well, that makes me sad. So, let me show you what I've got! These are from 2016, I think. If not, then early 2017. I've had them a while and am tired of seeing them on my shelf! Time to get these finished! I like each of these! These are from my 2" strips series from 2017 - of which I've hardly designed any this year so far. But I need to get these quilted! You've seen these all recently. These are the tops that are all finished, but not quilted. Yikes! Smaller quilts - I could probably whip these out in a day easily - just need to do it! Four more very different tops. The only small one is the QR code quilt - need to get that one done ASAP. Older quilt tops that have been being shoved to the bottom of the pile for some time now. Older ones. That middle one is a king size - enormous. Has hearts and applique - and I was scared to attempt quilting it when I made it. I'm really not so scared anymore. The others just don't inspire me but I need to finish them whether I am "inspired" or not! So how many does that make pictured here? A lot! Yep. A whole lot. So I had best get busy! I counted 45, I believe. These are mostly queen sized tops. This doesn't include any charity tops. They are in their own category of "things to do". I have a (small) pile of those I could do as well but I've already finished 120+ for this year, so I'm not letting them pressure me! Several of you have sent some nice tops so I've got a nice start on my next 120 tops! I think I'd best get off this computer and go quilt! Well, no, not really. I'm going to attempt to do it in a more disciplined, regular way than that. I'll begin to set regular goals and attempt to reach them unless it just gets too hot to make it feasible. Here's our weather forecast for the next week. While I'm showing yesterday (July 3nd), the hour by hour is actually showing the plan for the morning of the 4th of July. So even while it is supposed to get to almost 80F on July 4, until noon, it will be below 70. That are great quilting temperatures. (I am quilting using a domestic machine so I'm manhandling it a lot - thus it's warm and heavy)! if I can manage to sandwich them when it's not unbearable outside - or even first thing in the morning before I go to quilt for a while, I'd be okay. I'm beginning to realize that if I would get in my sewing room early n the morning while it is still cool, I could quilt for a couple of hours before it became hot - and maybe this is how I am going to tackle these piles of tops. I hate to put it all off until the winter - I might as well spread around the finished quilts - and not put them off, if I can help it. 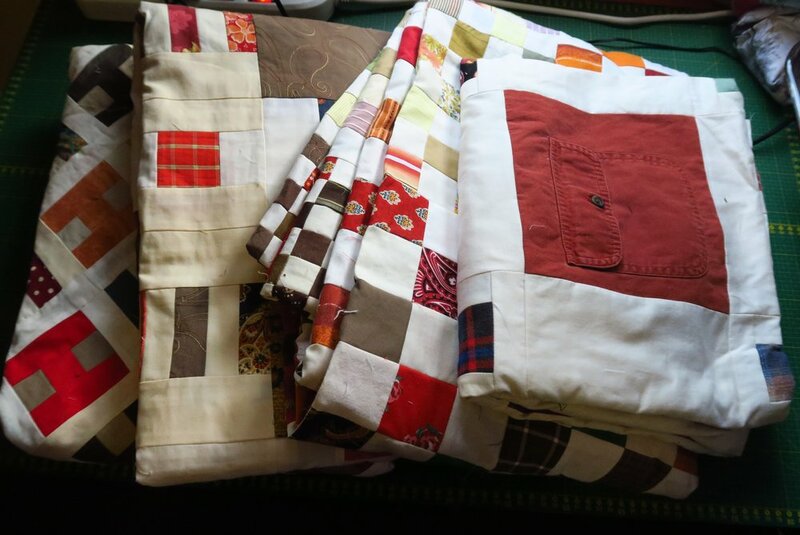 So...if I could plan ahead and watch the clock and get in my sewing room early in the morning when it is coolest, I could quilt - even in the summer. So I think I'm going to attempt to do that until I get these tops under control. I have some I made in 2016 as well as some quite a bit older - which I'd like to finish up completely - even if they end up getting put in the charity pile- that's okay too. I might use them as "charity but more special" for my husband's students who are mostly in the Ukraine. So we'll see how my plan goes. It will work if it doesn't actually get too hot until midday. If it starts off warm in my sewing room, it won't work. Obviously if I have to go and do something else first thing in the morning, when it is cool, that also will "blow the plan". So we'll see. I'll work out the details as I go along. It feels good to make a plan to attempt to solve the problem of having all these tops - as I probably have more than I've ever had in my life - and I had thought 20 or 25 was a lot. I can at least say I made an attempt! Baby steps, right? How about you? Do you like to have a bunch of tops that haven't been made into quilts yet? Do you have many? They are certainly smaller and easier to store than finished quilts! I know some people actually prefer to do it that way and then as they have a need, they pull from their tops to finish up for gifts. I know a top that hasn't been quilted yet is "technically" a UFO. However, I don't think of them the same was as I do a pile of blocks or pieces of a blocks that haven't been put together into a top yet. I don't entirely mind having tops - but I have too many for my shelves, so I have too many. It's really that simple. I'll deal with what I'm going to do with all these quilts in the future. For now I need to finish them! One "problem" at a time. I know I have a bunch of people who would gladly take one! I'm thinking.